Just got back from spending a day IN THE FUTURE! Ok, Kansas City where we met with local startups, big companies, Kauffman Foundation leaders and other folks thinking deeply about Google Fiber. 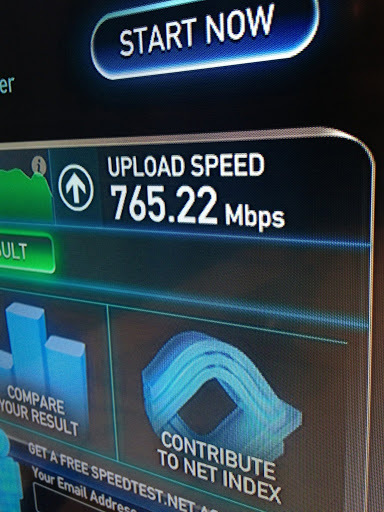 As you can see from our speed test screenshot it’s for real. Since Google Fiber is just rolling out, it’s not like there’s a whole bunch of specialized web products built around having 1GB speed. But when you play with it, the gap between you and Internet totally disappears. The computer is responsive in a manner that I’ve never experienced before. You can play multiple 4k YouTube videos without buffering. You download 1GB files during a tv commercial break. You just get more done. And that’s the point. People ask me what’s Google’s metagame with Fiber. My guess is the following: Use Fiber to reset consumer expectations of what a connected home should feel like. Continue to drive down the cost of deployment and sign up customers for a very sticky (high LTV) service by being first to market. If existing ISPs follow – or even beat Google in some many markets – Google still wins. Why? Because as I found out personally, when the Internet is this fast you do one more search per session, watch one more video per session, send one more email per session. A connected population benefits Google. Period. ← Optimizely Raises $28 Million via "Try Before You Buy"